The Syrian Refugee Crisis: Lessons From The Past Involving Jewish Refugees And Bolivia : Goats and Soda Observers draw a parallel between anti-refugee sentiments now and during WWII. Back then, many doors where closed to those fleeing Nazism. Bolivia was a notable exception. 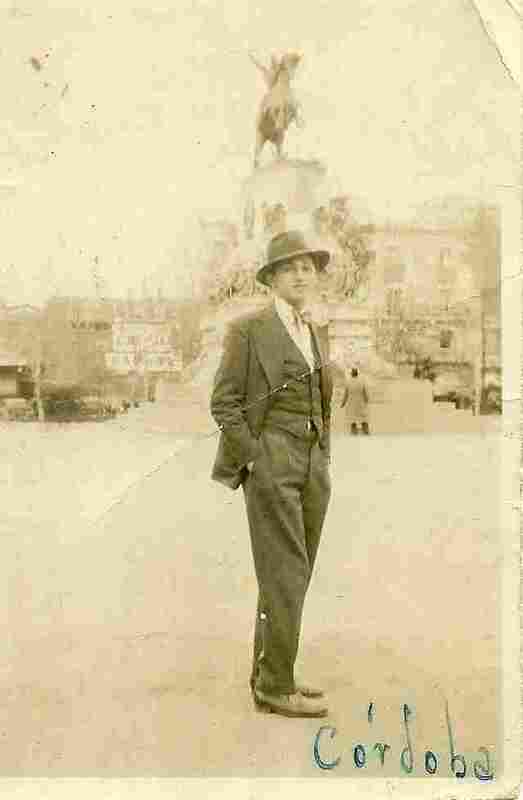 South America has a tradition of offering a haven to refugees, including my grandfather, Miguel Garsd, pictured here in Argentina, where he began practicing medicine in the 1930s. His family had fled pogroms in the Ukraine in the late 1800s. Back then, many of those refugees — Jews fleeing Nazism in Europe — turned to South America instead. But one by one, those countries stopped issuing visas to fleeing Jews. It was no surprise: for years Nazi and fascist ideology had incubated deep in South America. But away from all oceans and high up in the Andes, one small South American country kept its door open — a country that has had its share of economic problems and that even today is considered part of the developing world. It hadn't always been this way. Up until the 1930s, most of South America was open to immigration, including Jews. That tradition of offering a home to refugees is part of my family history. At the end of the 19th century, part of my father's family got out of Ukraine. The Jewish community, including my family, had lost several young men to a pogrom — an organized massacre of Jews. For 18 days, my ancestors lived on nothing but tea and matzo, saving their money for a boat ticket. They wrapped their feet in cloth (they couldn't afford shoes) and made for the port in Odessa. After what must have been weeks at sea, they landed in Buenos Aires. They were a drop in a tidal wave that kept on coming. Argentina allowed about 79,000 Jewish immigrants between 1918 and 1933. Another 24,000 came between 1933 and 1943. Brazil admitted 96,000 Jewish immigrants between 1918 and 1933. And around 20,000 Jews entered Argentina illegally, crossing the porous borders from neighboring countries. And that's not counting the tens of thousands of immigrants from the rest of Europe who were admitted into South America. My mother's family came, fleeing extreme poverty in Spain, around the same time. My dad's family couldn't find much work and lived in poverty. The children sold handkerchiefs on the streets. The light at the end of the tunnel was free college education, which exists to this day in Argentina. Immigrant families typically could only afford to let one son forego work and go to college. That's how my grandfather Miguel became a doctor. By the time he started his practice, in the 1930s, things had changed. Argentina had become Latin America's primary base for Nazi espionage. Other countries followed suit. Anti-Semitism flourished in neighboring Brazil under Getulio Vargas. By the late '30s, stringent anti-immigration laws had been established throughout the land, all the way to Colombia and Costa Rica. Consulates were under orders to stop giving visas. Ships carrying refugees were turned away. The most famous case is the St. Louis in May 1939. It was carrying 937 refugees. In Cuba, where the ship first attempted to dock, political infighting, economic crisis and right-wing xenophobia kept the passengers on board. The U.S denied the ship too, as did Canada. The St. Louis turned back to Europe. All in all, Latin American governments officially permitted only about 84,000 Jewish refugees between 1933 and 1945. That's less than half the number admitted during the previous 15 years. There were exceptions — again, often in countries that were far from well-off. The Dominican Republic issued several thousand visas. In the '40s El Salvador gave 20,000 passports to Jews under Nazi occupation. Former Mexican Consul to France Gilberto Bosques Saldivar is known as the "Mexican Schindler." Working in France from 1939 to 1943, he issued visas to around 40,000 people, mostly Jews and Spaniards. In South America, Bolivia was the anomaly. The government admitted more than 20,000 Jewish refugees between 1938 and 1941. The brains behind the operation was Mauricio Hochschild, a German Jew. He was a mining baron who had Bolivian President Germán Busch's ear (and who wanted to help his fellow Jews for humanitarian reasons). This was a time of economic crisis and uncertainty for the whole world, but Bolivia was in particularly bad shape. The Chaco War, fought against Paraguay until 1935, had just ended. Ironically, Bolivia's weakness was why the government agreed to open those doors wide open. Even though Busch flirted with Nazi ideology, he hoped that that immigrants would help revitalize the economy. Jews were given visas by various Bolivian consulates in Europe and shipped off to Chile. Then they were taken by train to La Paz. So many came, the train was nicknamed El Express Judio (The Jewish Express). A lot of them didn't stay in Bolivia: They eventually slipped illegally into neighboring Argentina, where they could find more infrastructure and a better established Jewish community. Toward the end of the war and in its aftermath, many of these countries began re-opening doors to Holocaust survivors. But for a lot of families, it was too little, too late. Oscar-winning Uruguayan folk-rock musician Jorge Drexler recently penned an ode to Bolivia and its open-door policy, which saved his grandparents, who were Jewish refugees from Nazi Germany. It's in the breathtaking record Bailar En La Cueva (2014) , an overlooked gem of a song called "Bolivia." "The doors where closing/time hung by a hair/and that child in the arms of my grandparents./The panic was evident/And everything foretold it ... And then the cold arrived/in the middle of a hurtful glacier, an unbelievable stream of warm water: Everyone said no, and Bolivia said yes." But it's the last lines of the song that are the most eerily reminiscent of the conversations we are having today about refugees. "The pendulum comes and goes ... ships come and go/those who today have it all/tomorrow implore for it all. The water wheel does not delay in turning destinies around, in refreshing memory ... a revolving door/that's all history is." Jasmine Garsd is an NPR reporter and and one of the hosts of NPR's Alt.Latino, a show about Latin music and culture.